The other night, I was playing a board game called Flux with my girlfriend and some church friends. The board game is quite interesting, as it is actually has no set rules. Each game is different, as the cards you play change the rules of the game. This means even the goal of the game can change throughout. To start the game off, there is a basic rule card. As the game continues, you draw cards and play them. There are goals, new rules, keepers, and action cards. Keepers are the usual means by which the game is won, as the goal cards usually require two specific keepers. The new rules apply in different ways to the game, keeping everything interesting at all times. During the game that night, my girlfriend played a new rule card, proudly saying the name as she played it, "Inflammation!" This was not the name of the card she played as she misspoke, and so after she said it I gave her a blank stare until she noticed and we all laughed about it. The actual name of the card is inflation, which increases all the numerals on the new rules in play by one. I guess she had a verbal typo? As always, the typo resulted in some laughter, but they can also be quite embarrassing. Most of the time on the internet, one can get quite embarrassed by some typos, and so they should be avoided at all costs. One of the tools to avoid these typos is for the right keyboard; preferably a mechanical one. Today, we have the GAMDIAS Hermes P1 RGB up for review. Could it be a worthy tool to prevent red-faced induced episodes from randoms on the Internet pointing out your mistake? Read on to find out! 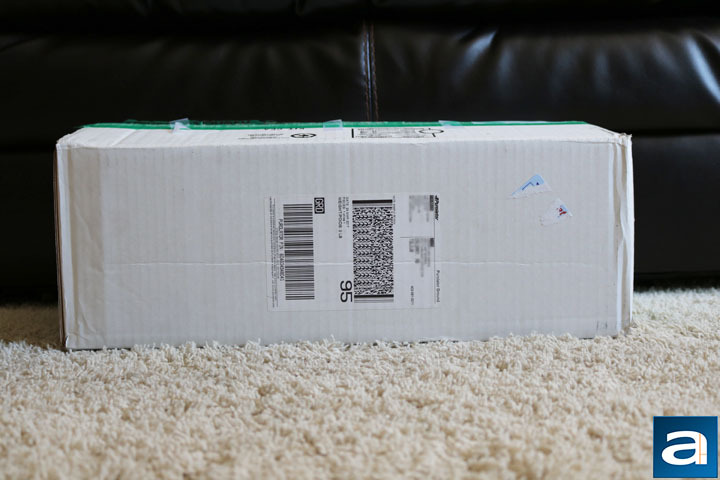 The GAMDIAS Hermes P1 RGB arrived in a large white shipping box. It arrived from Markham, Ontario to our lovely, sunny, and snowy Calgary, Alberta. As opposed to some of the other shipments we have received, this is quite a bit closer than normal. As such, the damage to the exterior is minimal. On each side, there are some dents to the box, and as usual, the corners are beat up quite a bit. However, the damage outside did not amount to any cause for alarm in regards to the safety of the product inside. From just moving the box around a bit, I could tell the inside has been safely packaged, as there was very little movement to the product. Upon opening the shipping box, I was proved right. I found an amalgamation of bubble wrap, large air pockets, and some other assorted cushioning devices inside. All in all, I am pleased with the effort placed into keeping the product safe. 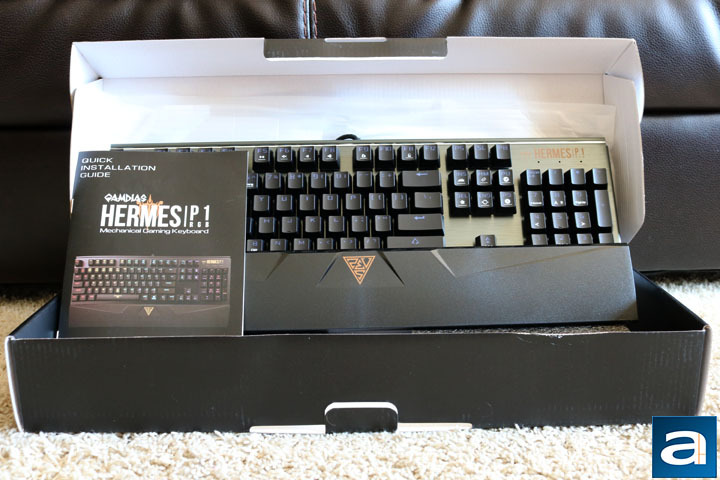 The GAMDIAS Hermes P1 RGB's retail box shares the same design with basically all of GAMDIAS' keyboards. The majority of the box's retail estate is occupied with a picture of the keyboard with a black background, while a smaller section is in white highlighting some of the major features of the keyboard. 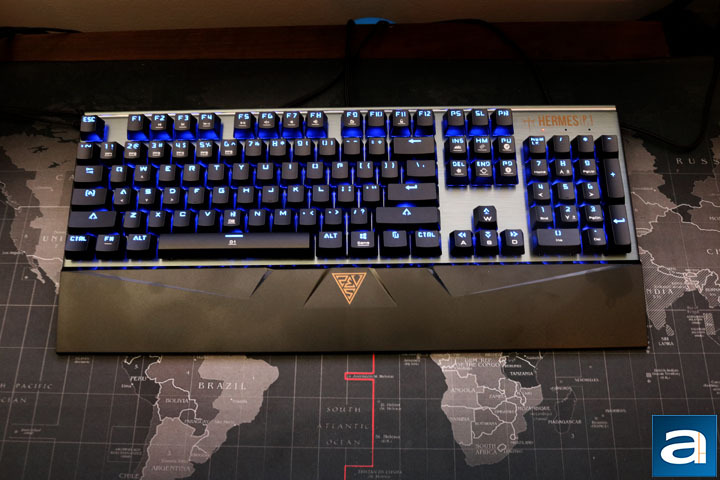 In this case, those features are RGB backlighting, two programmable macro keys, detachable wrist rest, and the fact the product uses GAMDIAS' HERA software. I find this last feature questionable, as in the past HERA has not been the friendliest to use. I would have placed the mechanical key switches on the front instead, but I am not in marketing, so what do I really know? Otherwise, the front is also populated with more advertisements of the RGB capability, the mechanical key switches is advertised in the bottom left, as well as the addition of a key switch puller. The back of the box reiterates much of the information found on the front while also adding some cautionary information. Overall, the retail packaging gets the message across effectively. 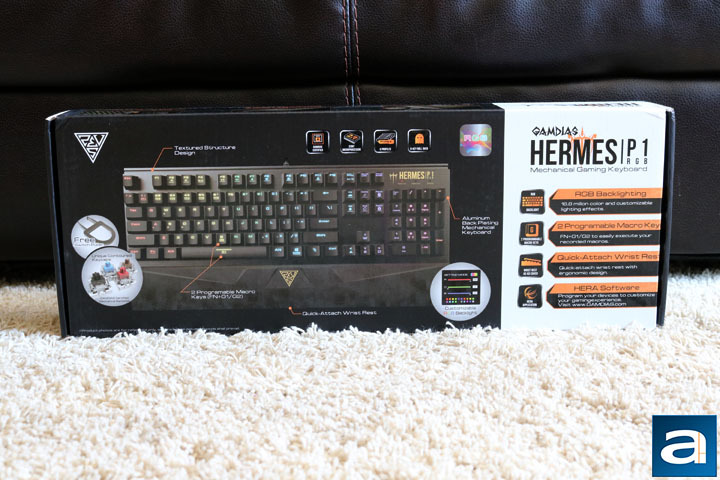 As for the packaging of the GAMDIAS Hermes P1 RGB, the usual is true. A foam bag protects the keyboard from any surface damage, while there are Styrofoam blocks on either side of the keyboard to keep everything in place and to prevent the keyboard from moving around. The detachable wrist rest is found in a plastic bag stored below the keyboard, while the key cap puller was nowhere in sight... just kidding! After looking around for a while, I found it attached to the underside of the keyboard. A manual is also included, allowing for quick access to finding the downloadable software and general usage information for the keyboard. The packaging is sufficient to keep the keyboard in place and secure. I would prefer some more Styrofoam around the keyboard and not just at one end, but what was included is enough. The GAMDIAS Hermes P1 RGB has one feature I have always appreciated on a keyboard: An exposed aluminum backplate. I find it always classes up a product a bit, and definitely adds to the build quality in a great way. The aluminum plate on the Hermes P1 RGB is a bit greenish in color, but it provides a clean look. What annoys me about this is that GAMDIAS advertises it with a black color, which is not really true. Regardless, the bottom stands out slightly, almost like a mini wrist rest, while the top has a trench before going straight down without extending far beyond the F-row of keys. The aluminum curves back on itself for a rounded edge, but the aluminum at the bottom of each curve is still slightly sharp. The two holes in the aluminum on the mini wrist rest I mentioned before is where the detachable wrist rest clips in. I found it a little difficult at first to ensure a correct alignment at each hole, but after some practice, it became a smooth process to attach and detach it. The wrist rest is made out of plastic and is not very large. It is not a clean look either, as the GAMDIAS logo is found at the center and there are some textures to it. Even though the wrist rest is not very large, it strikes an effective balance between too small or too big. 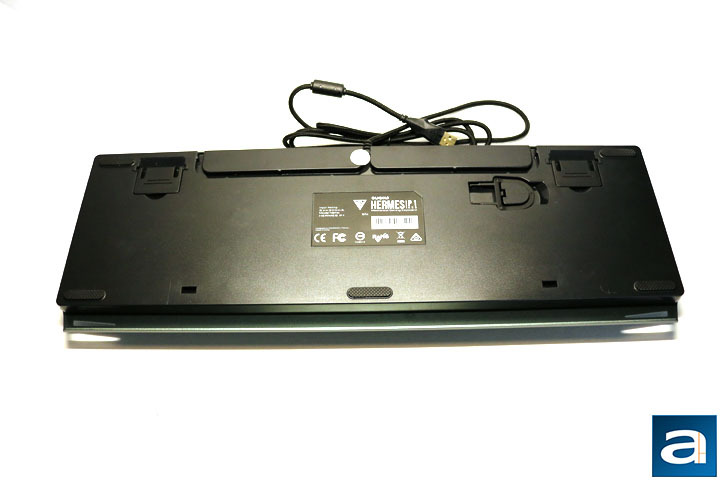 As for dimensions, without the wrist rest they are 448 mm in width, 156.6 mm in depth, and 36.9 mm in height. The wrist rest increases the depth to 202.4 mm. These dimensions are fairly standard for a full sized keyboard. I was even able to use it with the wrist rest on my tiny desk. I usually prefer a tenkeyless layout for more room, but the larger size of the GAMDIAS Hermes P1 RGB did not bother me much. However, the keyboard is quite heavy. With the wrist rest attached it weighs in at 1.56 kg, while without it comes in at 1.30 kg. In either case, this keyboard is not light by any means. Mechanical keyboards are usually quite a bit heavier than their cheaper counterparts. Another reason for how heavy this keyboard is relates to the aluminum plate. As aforementioned, it adds to the build quality of the keyboard, however, the plastic wrist rest and the plastic used for the rest of the keyboard feels a bit cheap. Otherwise, the build quality is solid. 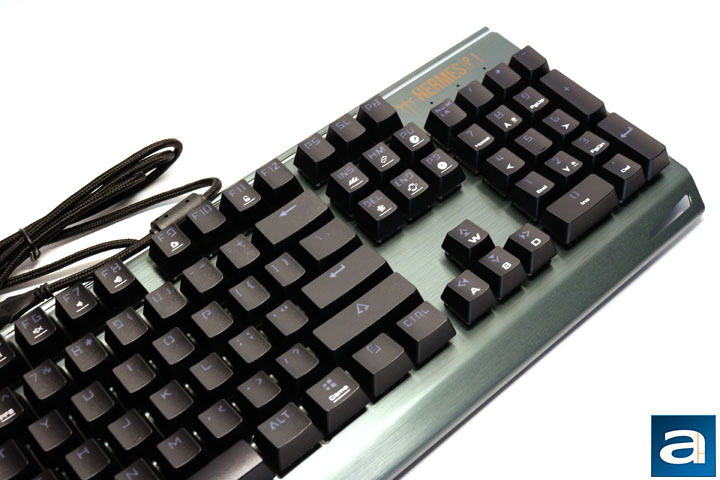 The GAMDIAS Hermes P1 RGB features a standard 104-key QWERTY ANSI layout. Most keyboards we have reviewed feature this layout. 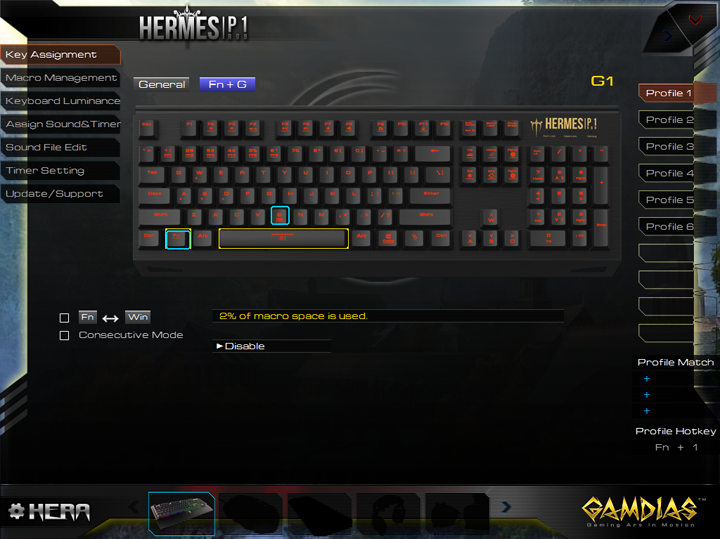 The GAMDIAS Hermes P1 RGB has one change from standard keyboards. The Windows key usually found in the bottom left is replaced with a Fn key, while the Windows key is instead placed on the right side. For a gaming keyboard, I find this to be a smart move, making it much harder to accidentally hit the Windows key during a game, even though the key can be locked. Other important keys found on this end of the keyboard are the two macro keys on the spacebar and B key. These can be used when the keyboard is in gaming mode and while being pressed in conjunction with Fn. Moving up from the bottom area of the keyboard, the WASD keys can be switched with the arrow keys, as indicated by the small directional arrows printed on each of them. This is achieved by pressing Fn + F4. Numbers 1 through 6 are pre-programmed lighting effects, that can be activated by pressing the key in conjunction with Fn. The same is true for the media keys found on F2 and F3. The rest of the media keys are found on F5 to F8. I find it really strange there is a gap between the media keys, and I see no advantage in doing it this way. There is a bit of advertisement dedicated to the keycaps themselves. The font is quite different from other GAMDIAS keyboards. It is most clearly seen, I think, on the Caps Lock and the shift keys. Otherwise, for most of the letters on the keycaps, they mostly just look more gamer themed than others thanks to the angular look. The keycaps are advertised to have a new sculpted design, which I found to mostly amount to the key being slightly more concave, as well as having some texture to it instead of being completely smooth. They have been comfortable to use. 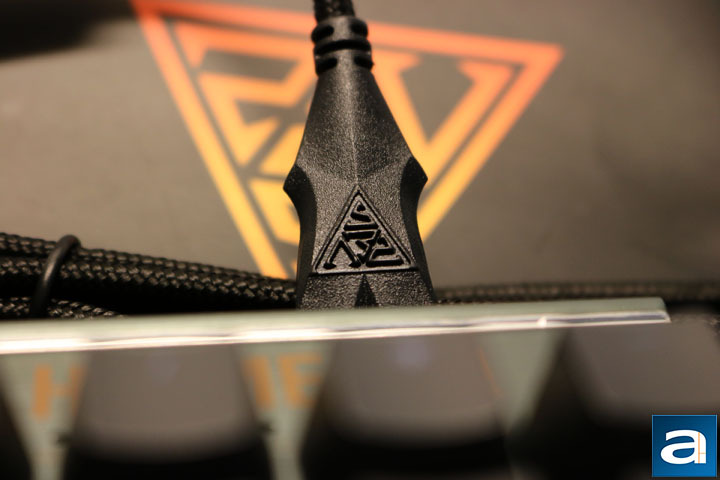 The GAMDIAS Hermes P1 RGB also features N-key rollover, meaning N-keys pressed simultaneously will be individually registered. A different version of this is 6-key rollover, which means six keys can be pressed in conjunction and registered individually; anything more will not be registered. This is quite an important feature on gaming keyboards. Normally, regardless of the game you are playing, it will require more than one key being pressed every now and then. This end of the GAMDIAS Hermes P1 RGB has considerably less features than the other side. F9 is the key to start recording a macro, while F11 locks all the keys on the keyboard; both of these functions can be activated by using the aforementioned key in conjunction with the Fn key. The cluster of six keys above the arrow keys are all lighting effects. I will talk about the lighting effects a little later in the review. The arrow keys also have WASD printed onto them, which is to indicate that you can interchange these keys using Fn + F4. Eight and two on the right number pad either increase or decrease the brightness of the lighting effects if used in conjunction with Fn. The Windows key found next to ALT, can be locked by pressing it and Fn. This also puts the keyboard in Gaming Mode, meaning the macros can now be used. If the keyboard is in Gaming Mode, a little red light turns on above the numeric keypad. There are three lights in this location in total, each indicating a different feature is either on or off. They are not too bright, but they are always red, potentially clashing with the color chosen for the rest of the keyboard. Above the three little red lights is the GAMDIAS Hermes P1 RGB branding. For gaming keyboards, or really any keyboard, the most important aspect for me is how nice or comfortable the keys are. My usual preference is Cherry MX Red switches because of the low actuation force. I also find typing on them to be a comfortable experience. On the GAMDIAS Hermes P1 RGB, it features TTC Blue mechanical key switches, making it a mechanical keyboard. Unfortunately, GAMDIAS never advertises the switches included in their keyboards. The usual is TTC, but there has been Kailh. GAMDIAS only says the switches are GAMDIAS certified. 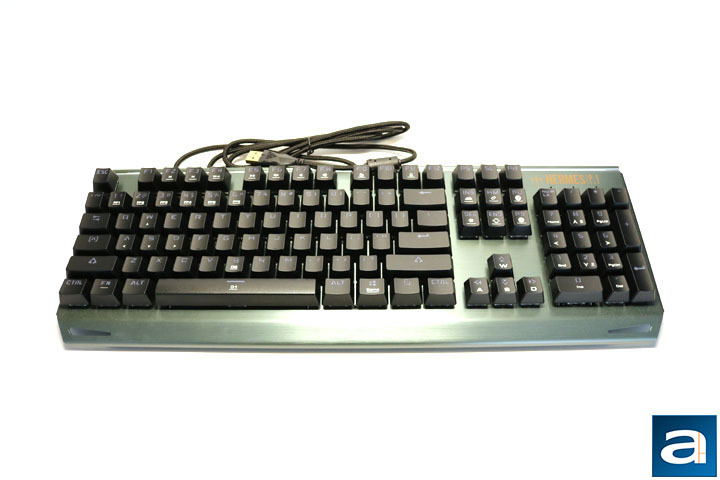 There are other types of popular keyboards on the market today are keyboards with membrane and scissor based switches. The membrane keyboard is the cheapest and has a squishy feel to it when typing, while the scissor keys are more responsive, and work well for everyday office use. 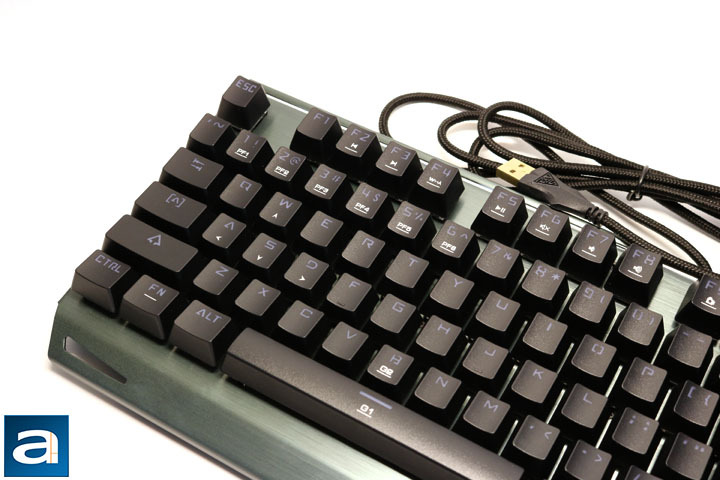 The mechanical keyboard is the most expensive of the three, because each key switch is an independent part. The more well-known brand of key switches for mechanical keyboards is Cherry MX, while others such as Kailh and TTC are an imitation of the Cherry MX, as their patent expired a few years ago. However, while most people will not notice a difference between the brands, there is a difference, and sometimes it is more pronounced, depending on the keyboard. The color of the switches play a big role in the typing or gaming experience. Starting at the most sensitive end of the spectrum is the Red switch, which offers the least resistance to fingers. These are linear switches with no tactile or audible bump in the middle. Next up are Brown switches are sort of found in the middle of the spectrum, with low resistance to typing. They are nonlinear switches but they lack any audible click like the Red switch. 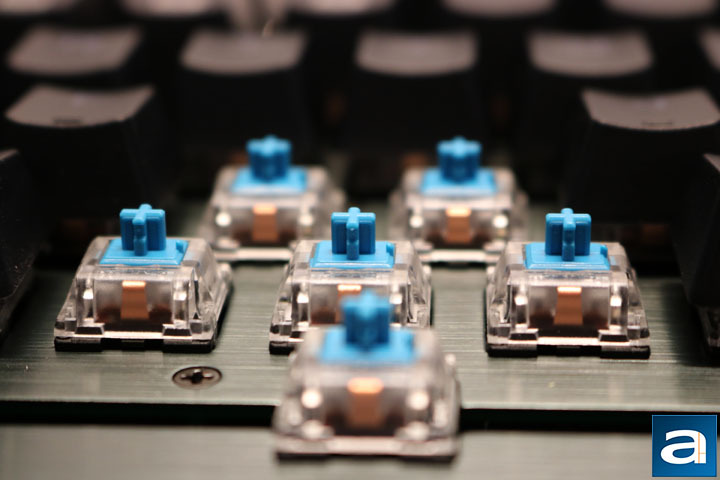 Blue switches have a slightly higher resistance and are known for providing a great typing experience due to its audible and tactile click feedback. Black switches have the most resistance, and are also good for gaming, but all of these are still largely personal preference. The bottom of the keyboard is fairly standard, except for the keycap puller lodged into the bottom. I find a very helpful addition, as it is an easy instrument to lose when it is not attached or even forget. That said, the aluminum back plate design makes removing the keycaps by hand quite easy. The rest of the back has a sticker in the middle with some information on it, while there are also four rubber feet found at each corner of the keyboard, with one in bottom center as well. These feet do a good job of keeping this heavy keyboard in place. Only the bottom of the two stands have rubber to keep the keyboard in place, so it is recommendable to always have those extended. I found the tracks for the cable the most confusing addition to the back of this keyboard. The cable extends out of the GAMDIAS Hermes P1 RGB in a way that makes it impossible to use the tracks. I find it likely the plastic design on the back is a standard design for more than just the Hermes P1, but also for other GAMDIAS keyboards. This can be troubling as it is an oversight from GAMDIAS; it leads to the conclusion that every keyboard is not individually designed, or it is just a cost saving measure. Regardless, it would be nice to have been able to use the tracks somehow for some extra cable management. Speaking of the cable, it is a braided cable with a gold plated USB connector at the end. The gold does not do anything for connectivity speeds, but it sure does look good when it is not plugged in. The software was easy enough to find following the instructions in the manual. GAMDIAS uses the Hera software to drive quite a few of their other products like the GKC1001 and Hephaestus Almighty, making controlling multiple products easier. However, using the software was not the best experience, even if everything was set out clearly. The first tab, Key Assignment, allows you to change the keys to perform different functions. You can make any key be something like media functions, shut down your computer, or even launch an application. On this tab, you can also change the current profile. The Macro Management tab is for recording and editing macros. Keyboard Luminance allows you to change everything about the backlight, from increasing the speed of an effect to making each key a different color. Next is assigning timers and sounds to individual keys. After editing or creating sounds or timers in the other two tabs, you can assign those timers and sounds to the rest of the keyboard. The sounds can either happen as the key is pressed, or when the timer finishes. This is a very useful function for anyone who enjoy playing games like World of Warcraft, where there are many different abilities to keep track of. The last tab is where all the software version information is found. What made the software frustrating to use was how it would freeze for a few seconds when switching between the different tabs. It was not as user-friendly as I thought it should be, since some functions were hard to figure out. In some rare occasions, the software would just freeze altogether, and I would have to force close it. There are some spelling mistakes on a few screens too. Overall, the software was functional, but still requires a substantial amount of work to smooth out the edges. There are twelve different lighting effects for the GAMDIAS Hermes P1 RGB, all of which can be changed in software. Four of these effects can be changed using the keyboard using Ins, Home, Del, or End in conjunction with the Fn key. There also controls on the Hermes P1 RGB to adjust the speed and brightness of the lighting effects, using either Page Up and Page Down or 8 and 2 on the number pad, respectively. On each profile, you can also change each keys color individually. Lastly, there is also the option of just having a single static color. Overall, everything you would like in RGB color effects are found on this keyboard, however you cannot play snake with the lights on your keyboard. Not that we have seen it before, of course. The GAMDIAS Hermes P1 RGB was comfortable to use. It is a full sized keyboard, so it does take up quite a lot of space on my desk, but the number pad was a welcome addition compared to my previous tenkeyless keyboards. I found the TTC Blue switches to be responsive, and the key actuation throughout the keyboard was consistent. The Blue switches also had the satisfying click they are known for. While they do make an absurd amount of noise, they really were a joy to type on. I compared the GAMDIAS Hermes P1 RGB TTC Blue switches to another keyboard with original Cherry MX Blue switches, and I found the TTC switches to be close, but still distinguishable from the Cherry MX model. The blue TTC switches were responsive, and had a very loud and satisfying click from key actuation. The detachable wrist rest is difficult to attach, but it is a good size, making it comfortable and space efficient in smaller areas. It is always nicer to have a wrist rest attaching with magnets, but the plastic clip is good enough. Overall, I had a pleasant experience using the GAMDIAS Hermes P1 RGB. Is the GAMDIAS Hermes P1 RGB a good keyboard? Yes. The build quality is solid with the aluminum plate. I will say I am slightly annoyed that the manufacturer's website advertises it with a black color, while it is actually quite a bit green. The plate ensures minimal flex ensuring good build quality. The rest of the keyboard is constructed from plastic; the same goes for the detachable wrist rest. I appreciate GAMDIAS taking this step instead of just adding a large non-detachable, which some of their products have done in the past. The way the wrist rest attaches can be improved upon, since it can be difficult to line up, and can potentially break. Using magnets would be ideal to make the process easier. The keycaps have a different sculpted design to them making them a bit more concave, and I actually quite like this. The key switches are good, as I do not think the difference between TTC and Cherry MX switches are significant enough unless you are a picky keyboard user. However, for those who are picky, there is just something about genuine Cherry MX switches that make for a smoother feel overall. For the software, this area requires the most work. After all this time, there are still spelling mistakes found throughout, the software is still quite slow switching between different tabs, and it is difficult to do things like programming macros. It might be functional enough to adjust the RGB lighting features, but the lack of polish here really makes me want to avoid Hera altogether. The GAMDIAS Hermes P1 RGB comes in at a price of $100 USD, which is actually quite reasonable for an RGB keyboard and a detachable wrist rest. The usual price for a mechanical and RGB keyboard is around $130 USD, so the cheaper price is quite nice, and probably the most attractive part of this keyboard -- if you are willing to give up real Cherry MX switches. GAMDIAS provided this product to APH Networks for the purpose of evaluation. Included software aside, the GAMDIAS Hermes P1 RGB is actually a pretty good keyboard with TTC switches for the lower price point. Do you have any comments or questions about the GAMDIAS Hermes P1 RGB? Drop by our Forums. Registration is free, and it only takes a minute! posted 1 day and 20 hours ago, with 1 posts. posted 1 day and 20 hours ago, with 7 posts. posted 1 day and 20 hours ago, with 6 posts. posted 1 day and 20 hours ago, with 14 posts. posted 1 day and 20 hours ago, with 58 posts. posted 1 day and 20 hours ago, with 13 posts. posted 1 day and 20 hours ago, with 10 posts. posted 1 day and 20 hours ago, with 12 posts.